Anyone wishing to mod their Android device will have encountered tutorials and step-by-step guides advising them to run various different ADB and/or Fastboot commands. One of the great things about Android is that there are so many different command-line tools such as the above, although one issue is that the average user can get quite quickly lost or intimidated by the black screen and flashing cursor, which looks to some like an expert-only tool. The world of Android can appear quite scary, and with so many different devices and tools available, it can often confuse to the point where one decides to wave the white flag. This needn’t be the case, though, and if you don’t want, or don’t feel adept to using a command-line tool to communicate with your device without a GUI, then Quick ADB Pusher, created by XDA Developer member Goatshocker may just be your solution. It offers a proper user interface as opposed to a command prompt, thus making it more approachable to the Average Joe. 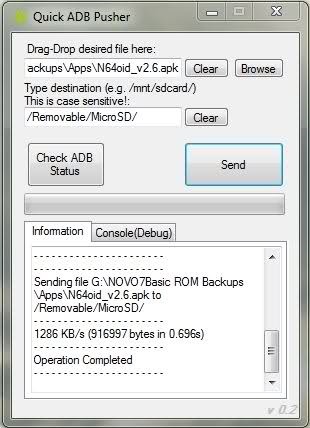 Goatshocker – like many Android users, notes that he found himself growing tired of having to incessantly enable / disable USBMS on his phone, which is quite slow with re-mounting the SD card. Another reason he decided to create the tool, was that he became impatient in the slow speed of file transfer from PC to his tablet’s internal storage. So, instead of using the command prompt, all you need to do with Quick ADB Pusher is drag and drop; how simple is that? You can effortlessly push any file to any location on your device, and there’s an information window included which will notify you if the transfer was completed or, if not, what went wrong. Quick ADB Pusher is an excellent time-saver, since you won’t need to mount or unmount your SD card just to transfer one or two minor small files you forgot to. Although it already has some great features, the developer plans to implement some sort of browser for the Android in order to make it a bit easier to choose the destination. Additionally, future versions could also cater for direct installation of .APKs, and Goatshocker also suggests a cancel-transfer function may be added at a later date.